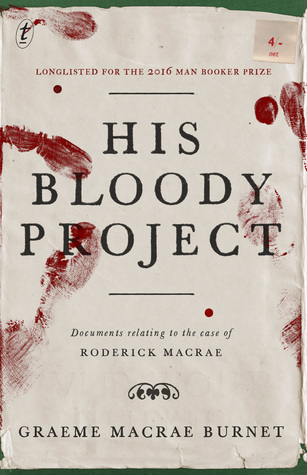 Longlisted for the Man Booker Prize, His Bloody Project is the second novel of Scots author Graeme Macrae Burnet. It’s mildly interesting, but I can’t quite see why it merits longlisting. It’s a pastiche purporting to be True Crime. Relating the case of the brutal murder of three people in the Scots Highlands in 1869, it consists of a preface, statements by locals, the murderer’s account of events, medical reports, an excerpt about the case in a book about lunacy, a report of the trial and an epilogue. As you’d expect, these documents are not consistent with each other, and the reader is left in the same position as the purported jury: was he mad or was he bad? I don’t like reading true crime. The media tells me quite enough about the awful things that people do to each other, and I think it’s ghoulish to wallow in the details. So I’m not really predisposed to read something that’s purporting to be true crime. But that’s not why I’m a bit underwhelmed. I just don’t think this book has anything of any great significance about it. The book unpacks the back story of the accused and his unedifying life in a miserable village in the Highlands. A case is made that he acted to avenge the persecution of his father by the local bully who was misusing the power invested in him by an indifferent laird. The waters are muddied by some aspects of the case not mentioned in his own account of events, and there’s an assortment of perspectives from the villagers and a medical assessment made at a time when mental illness was not understood. The account of the trial is really quite boring (unless you like that kind of thing, of course) and the verdict is entirely predictable. The blurb claims that it’s a story about the provisional nature of truth, even when the facts are clear. But so what? We all know that truth is a slippery beast anyway. It also claims that it’s a deeply imagined historical novel but it’s no better or worse than any number of historical novels I’ve read, and not in the same league as something like Wolf Hall. No, for me, His Bloody Project is shallow and ordinary, and even its form has been done before. Really, with the wealth of novels eligible for this prize, was this really among the very best? In the United States ‘Bloody’ is not considered a swear word, but it would rarely be used in everyday speech. This is a really interesting review, but I am a bit confused. I thought Text was an Australian publisher. Have they published a book first published elsewhere? To what extent is the murder real and all the documents real? I don’t like true crime for the same reasons you give but I am trying to work out what constitutes a novel and what is non-fiction and whether this blurs the edges. As I enjoy some books in the crime genre, I am really interested by what you find dull and love the fact that you are so open with your assessment and questioning what justifies the high praise of the long listing. You’re right, Lynne, Text is Australian, but they’re proactive in securing the rights to international titles including translated fiction as well. That means they can publish their own editions of the titles, and that’s what this is. I gather from what I’ve read that the all the events are invented, murder and all, but that he’s used research e.g. to include the ‘medical assessment’ invented from medical texts of the period. But LOL, as to what constitutes a novel these days, well, it’s very much open to debate. Theoretically, fiction is what’s invented, but if you invent a novel about Lynne Kelly using some of the facts of her real life, is it a novel? OTOH if you write a biography about Lynne Kelly, and you invent some of the gaps in your research, is that non-fiction? In the case of this ‘novel;’, it’s fiction, but it doesn’t feature the aspects of novels that I like because it reads like true crime. Our modern world is very messy! I guess ‘collages’ like this are considered innovative, I think they’re mostly just lazy. I think, given my low opinion of the Luminaries and Narrow Road (and Peter Carey), that the Booker judges don’t have very high standards (or perhaps they’re just different to mine). Well, I would agree that the Booker is going through a phase that makes it a disappointment to readers like us. The Folio Prize was going to be a serious prize, but it fizzled out after a couple of years. I’m keeping an eye on the Goldsmith Prize, but I’ve learned not to be too hopeful. Nooooo, sorry, I haven’t expressed it clearly, The Narrow Road is the one that’s not the crime novel, the other two are. I know what you mean about eBooks and checking back – I had to do that a few times because some characters have more than one name e.g. Lachlan Broad is also Lachlan Mackenzie and it’s a bit confusing until you get used to it. But also because the book is a form of testimony and the testimonies don’t always match, you read something and then a contradiction, and you need to go back and forth to see the context of the contradiction – is it a mistake, is it a lie, am I the reader confused or mistaken and so on. Now shortlisted! Everyone I know who has read it has been similarly underwhelmed. So, we’re all underwhelmed. What does this tell us about the Booker Prize? Should we ignore it from now onward? Well, I really enjoyed Paul Beatty’s The Sellout, and some of the others are well liked. I think you just happened on the poorest one this year! You’re right, I was being churlish. I did like The Many. But I was totally underwhelmed by The Luminaries and cannot muster any interest in Seven Killings, so I’m a bit predisposed to be churlish. If it hadn’t been for them giving the gong to The Narrow Road, it would have been curtains for The Booker, for me! I read His Bloody Project, and found it at times interesting for the setting and time, but also a bit boring. As to the other books selected for the Man Booker, I have read all except for Do Not Say we Have Nothing, which I hope to read this weekend. The only one I have liked so far is Eileen. I loved this book! The structure and set-up of a wild, dark story framed in the form of ‘real’ documents has a long and prestigious pedigree in literature. I love Robert Louis Stevenson, and he uses this technique a lot – so this was very much my cup of tea. I agree that ambiguity, particularly in crime fiction, can be annoying – but I didn’t find it so in this. I like ambiguity , it’s like life:) But I know that many readers don’t, they want books to be forthright and neat and clear, reassuringly unlike life. I think it’s good to let them know if a book is ambiguous, if it’s not consistent with the expectations people have of a certain genre. I was happy to read that you found this novel just so-so. I too found it ordinary and was wondering why it received such high praise. However, I didn’t find it especially ambiguous, except that different people have different opinions of other people. To me, that goes without saying. I did enjoy the structure–the set up of different documents–and I often enjoy crime fiction, so those aren’t the reasons it disappointed me.